Latin America’s relationship with the U.S. government has been difficult to say the least. The U.S. has been intervening in Latin America since President James Monroe established the Monroe Doctrine, a foreign policy that prevented European powers from colonizing any sovereign nation in “their backyard” (that was America’s job!). The Monroe Doctrine became an instrumental tool for Washington to advance American style Democracy and dominate governments in South and Central America and the Caribbean which brings us to Cuba. Cuba was one of the last colonial possessions under Spanish rule just 90 miles south of Florida. As Spain’s Imperial power was in decline, Washington had imperial ambitions to expand its influence on Cuba. Cuba had the potential to produce unlimited profits for U.S. business interests. Even organized crime got into the picture when they became a major player in Cuba since the early 1930’s. The mafia controlled the gaming industry, prostitution and the drug trade in the U.S. mainland also had their sights on Cuba. The mafia managed to expand their operations to Cuba to avoid harassment from the U.S. government. Cuba was to be their base of operations as they were looking to expand into other Caribbean nations. During that time, Cuba was under the leadership of President Fulgencio Batista who had close political ties to Washington and its multinational corporations. Batista was also a good friend to organized crime. Cuba became a cesspool of corruption, illegal drugs and prostitution which became a playground (metaphorically speaking) for the rich and famous while the majority of ordinary Cubans lived in extreme poverty. This is an historical account of Cuba before 1959, a time period that explains why Cuba’s Revolution was a long time in the making. Back in 1823, US President James Monroe established the Monroe Doctrine, a US foreign policy directive that prevented any European power from colonizing countries in Latin America to protect its sphere of influence. US interests took precedence over any land disputes with European powers except Cuba, who was still under Spanish rule. At the start of the American Civil War, the Union (the national government of the North) was concerned that the Confederacy (who formed a breakaway republic in the South) would have received military aid from Spain. The Union was also concerned that Spain would have eventually intervened on the side of the Confederates since Cuba was an ideal place to expand slave plantations with the possibility of creating a new state to counter balance the rise of free states to the North. The Confederacy wanted the Union to purchase Cuba and turn it into a Slave plantation despite the fact that the Cuban people demanded freedom and independence from Spain. However, President Abraham Lincoln sent a newly appointed Minister to Spain by the name of Carl Schurz to prevent Spain’s recognition of the Confederacy and any form of military aid during the war. Minister Schurz convinced the Spanish court that the Confederates wanted to annex Cuba. Spain declared neutrality on June 17, 1861. By 1868, the Ten Years War for Cuba’s independence had begun but was eventually defeated by Spanish government by 1878. The Pact of Zanjón, a treaty that ended the ten year war and liberated slaves who fought in the war. The treaty did not satisfy the Cubans who wanted full independence from Spain. José Martí, a revolutionary philosopher and advocate for Cuba’s independence was in exile. Marti had planned an invasion of Cuba with groups from the Dominican Republic, Costa Rica and the United States (which was prevented by American officials) to invade Cuba through different routes and create an uprising by the Cuban people. Marti and his revolutionaries began the ‘Grito de Baire,’ a guerilla war which the Spanish government eventually defeated. As revolts against the Spanish government continued, U.S. President McKinley decided to take action in support of the Cuban resistance. McKinley wanted to end the revolt through a peaceful resolution, so he threatened the Spanish government with his administration and U.S. companies that manufacture weapons would consider recognizing Cuba’s status and provide weapons to the Cuban insurgents. He sent Stewart L. Woodford to Madrid to negotiate an end to the conflict. Negotiations followed with the Prime Minister of Spain, Práxedes Sagasta, (who supported Cuban autonomy) proved to be a success. Cuban autonomy was set to begin on January 1, 1898. After the Cuban Autonomous government came to power, riots followed after Spanish officers who were offended by newspapers critical of General Valeriano Weyler’s policies. Future US President and Nobel Peace Prize recipient Theodore Roosevelt was the Assistant Secretary of the Navy at the time and a staunch supporter of war against Spain over Cuba. Roosevelt supported the Monroe Doctrine and prepared the Navy and the Asiatic Squadron led by Admiral George Dewey for war against Spain. He advocated the Army to recruit an all-volunteer force who would eventually become the 1st U.S. Volunteer Cavalry known as the “Rough Riders.” The US military’s readiness for war was evident. Then McKinley sent the USS Maine to Havana to protect American interests. The US notified the Spanish government prior to its arrival. On October 1897, the USS Maine was to be deployed to Key West, Florida as part of a strategy with other US Naval ships located in close proximity to Cuba in case of a war with Spain due to political tensions between Madrid and Washington. On February 15, 1898, the USS Maine exploded in the Havana Harbor after a massive explosion. Propaganda to sell newspapers took center stage during the crisis as Joseph Pulitzer of the New York World and William Randolph Hearst of the New York Journal took advantage of the situation and sold war to the public. Both newspaper outlets covered the entire situation in Cuba regarding Spain’s alleged actions. The explosion caused 266 sailors their lives. In 1975, an investigation by US Admiral Hyman Rickover concluded that there was no evidence of any external explosion and that the explosion was an “internal incident” caused by a coal dust explosion. However, due to the power of ‘Yellow Journalism’, the American public’s negative attitude towards Spain because of the explosion demanded a swift military response. The U.S. government and its business entities had “special interests” in Cuba. But it was disrupted by the incident as it created uncertainty about the future of Cuba. After Spain’s defeat, one dictatorship after another soon followed. Cuba became an important economic trade zone for American businesses. Once the U.S. gained control of Cuba, it expanded its economic and political monopoly expanding its power over the Cuban people. U.S. congress passed the ‘Teller Amendment’ in 1898 which did guarantee Cuba’s independence but was replaced in 1901 by the ‘Platt Amendment’ which gave Washington the power to intervene in Cuba if their interests were threatened. By 1908, Cubans who fought against Spain created a new independent political party but were oppressed and eventually massacred by the U.S. backed Cuban government. The Partido Independiente de Color (PIC) was composed of former African slaves and war veterans of the1896 Cuban War of Independence. The PIC won enough votes that undermined the ruling liberal party under President José Miguel Gómez. President Gomez ordered the party to disband under Cuban law which outlawed any political party based on race although the law favored white Cubans. The PIC staged a revolt under General Evaristo Estanoz. However, General Jose de Jesus Monteagudo suspended constitutional rights and ordered an attack against Afro-Cubans. The US intervened and sent troops to back President Gomez and protect its vital business interests. More than 5,000 Afro-Cubans were massacred by lynch mobs because of their skin color. All Afro-Cubans were under suspicion by the Gomez regime. Gerardo Machado y Morales was President of Cuba from 1925 until 1933 and a former general of the Cuban War of Independence who was interested in ending the Platt Amendment. Machado was an elitist and an industrialist who wanted to turn Cuba into the“Switzerland of the Americas.” By 1928, an economic depression was taking place in Cuba due to a decline in sugar prices and the stock market crash of 1929 which led to political instability. On December 23, 1931, political opposition in Cuba grew which called for fair elections, but Machado remained resistant to the opposition. By 1933, a civil war was brewing due to escalating violence between the Machado regime and the political opposition groups including students, organized labor and other various groups. On May 8 1933 Sumner Welles, a U.S. envoy was sent by U.S. President Franklin D. Roosevelt to analyze the “Cuban situation.” By July 21st, Welles demanded that Machado reinstitute the constitutional guarantees that he removed under his leadership. Machado refused, so Welles negotiated an end to Machado’s presidency which paved the way for a new presidency under Carlos Manuel de Céspedes. Cespedes became provisional president, but was overthrown during the Revolt of the Sergeants. The Coup was led by Fulgencio Batista y Zaldívar, an army sergeant and a stenographer on September 5th, 1933. Soon after the coup, the University of Havana representative for the students and professors Ramón Grau San Martín became president and Batista became the Army Chief of Staff as a colonel. This was when Batista’s rise to power became evident because he controlled the short-lived five-member Presidency known as the ‘Pentarchy of 1933’ which included representatives from the anti-Machado factions. Batista oversaw the purge of commissioned officer corps who was forced to retire and some were possibly executed. Batista had full control over numerous puppet presidents until 1940. Grau was president for more than 100 days before Batista forced him to resign in 1934 with the backing of Sumner Welles. Carlos Mendieta was made President which Washington immediately recognized as Cuba’s new President of the government. However, the new government of Mendieta lasted for about eleven months. Then a number of short-lived puppet governments led by José Barnet and Miguel Mariano Gómez and then Federico Laredo Brú, who was president of Cuba from December 1936 to October 1940. 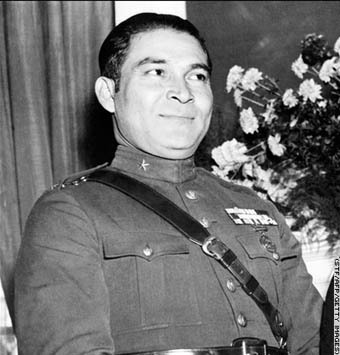 Batista was then elected President to a 4-year term in 1940 and eventually became the de-facto dictator from 1952 to 1959. Batista then re-instated the 1940 Constitution of Cuba which ironically was considered a progressive platform. He supported labor unions which the old Communist party was pleased with. He established economic reforms and even declared war on Nazi Germany, Mussolini’s Italy and Franco’s Spain in 1941. When his Presidential term was over in 1944 he chose Carlos Saladrigas Zayas to be his successor but was defeated by Ramon Grau. Batista then decided to live in the United States but was still heavily involved in Cuban politics and in 1948 was elected to the Cuban Senate in absentia. He returned to Cuba to run for president. President Grau at the time gave Batista permission to form the United Action Party then he founded the Progressive Action Party. Batista lost popularity among the Cuban people but the unions remained supportive of Batista. But that did not prevent Batista’s desire to rule Cuba. B atista returned to Cuba for an uncertain presidential run in 1952 that faced an uphill battle with polls that suggested otherpresidential candidates were in the lead. Elections were canceled since Batista’s party was in last place, so he led a military coup against President Carlos Prio Socarras that put him back in power. Washington immediately recognized the new Cuban government. Batista took action and suspended the 1940 Constitution he initially supported and canceled the Cuban people’s remaining civil liberties. He also backed wealthy landowners who owned sugar plantations. When Batista took over the Cuban economy, it was already in a steady decline. However, during the 1950’s, Cuba was a developed nation with a GDP ratio equal to Italy. The gap between rich and poor widened and government corruption became rampant although industrial worker’s wages did rise significantly. Batista began to reap enormous profits from Cuba’s business interests. He aligned himself with the Italian and the Jewish mafia from the United States who controlled drugs, gambling and prostitution rings in the U.S. The Batista government was favored by American-based corporations that had invested in Cuba. It was clear that Batista’s new policies were not as progressive as his first term in office. It began on July 26, 1953; an attack on the Moncada Barracks in Santiago led by Fidel Castro but was defeated by Batista’s armed forces. Leaders of the insurgency were imprisoned while others fled Cuba. By 1954, Batista held elections as a candidate of a political coalition of three different parties including the Progressive Action Party, the Radical Union Party and the Liberal Party which did win by fraud and intimidation. The elections were boycotted by the parties who participated in the elections because potential voters were harassed and terrorized by Batista’s supporters. Student riots and anti-Batista protests became the norm due to high-unemployment rates especially among college graduates. Batista’s forces dealt with the protests through repressive actions. The University of Havana was temporarily closed on November 30, 1956 due to anti-Batista student protests. Torture and murder of suspected revolutionaries took place in the inner cities. Batista was concerned about Castro so he ordered his secret police to torture and murder people in public to install fear in the population in case they were considering joining the growing revolution. Batista’s actions only angered the Cuban people and increased support for the July 26 Movement. Many organizations joined the movement from all types of backgrounds from the middle class including lawyers, doctors, accountants and many others united with the poor (who were already fighting against government forces). The U.S. provided military aid to the Batista regime in an effort to defeat the insurgency. Then on March 1958, the U.S. government stopped selling arms to the Cuban government followed by an arms embargo although the wealthy land owners and many in the West continued to support Batista. A new election were supposed to take place on June 1958, but was temporally delayed until November due to Castro’s revolutionaries who called for a general strike as violence continued to plague Cuba. Organized crime infiltrated Havana with gambling operations, drugs and prostitution rings. They also controlled racetracks and nightclubs that mostly catered to American and Cuban elites. Hollywood has produced films about the mafia avoiding the U.S. government from prosecution, but that was further from the truth. Throughout history, the mafia and the U.S. government have collaborated on a number of occasions. However, the mafia did protect east coast docks stationed by the Atlantic Ocean from saboteurs and even crushed labor union strikers. They also prevented any theft of U.S. war supplies and equipment. The mafia saw it as an opportunity. If they protected the docks as a favor, they would be allowed to continue their criminal enterprises without government interference. Operation Underworld began after the attack on Pearl Harbor when the U.S. lost numerous merchant ships to German U-boats and merchant raiders during the ‘Battle of the Atlantic.’ Operation Underworld is proof that the U.S. government’s ‘Office of Strategic Services’(OSS) which eventually became the Central Intelligence Agency (CIA) and organized crime has an extensive history together dating back to World War II. The CIA conspired with a Chicago gangster described as “the chieftain of the Cosa Nostra and the successor to Al Capone” in a bungled 1960 attempt to assassinate Fidel Castro, the leader of Cuba’s communist revolution, according to classified documents published by the agency yesterday. Havana was the Las Vegas of the Caribbean that reaped gambling, prostitution and drug profits (cocaine and marijuana) for the mafia. Mobsters were making a fortune on the backs of the Cuban people as were corrupt law-enforcement and high-ranking political officials aligned with Batista. Batista’s relationship with Meyer Lansky and Lucky Luciano was a gangster’s dream. Havana became to be known as the ‘Latin Las Vegas’. In one of Francis Ford Coppola’s classic film trilogy ‘The Godfather II’ based on the book by Mario Puzo exposes a historical truth. Michael Corleone (played by Al Pacino) and Hyman Roth who was Meyer Lansky in real life played by Lee Strasberg along with several representatives of major multinational corporations had major business interests in Cuba. In the film, Roth wanted Michael Corleone assassinated, but in real life the Italian and Jewish mafia were partners in Cuba looking to further expand their operations in the Caribbean. As an “expression of gratitude” in both real life and in the film, the ITT Corporation, a U.S. based multinational telephone company bestowed a ‘Golden Telephone’ in Batista’s honor for the rate increase he imposed in Cuba (as requested by the U.S. government) which made telephone usage expensive for the majority of the Cuban people. ‘The Godfather II’ was closer to the truth then what the main-stream media would have reported during that time period. The U.S. media portrayed Batista in a positive light until the very end of his dictatorship. On December 11, 1958, U.S. Ambassador Earl Smith told Batista that the United States could no longer support his government. The U.S. denied Batista asylum and suggested that he go to Spain. On New Year’s Eve party, Batista told his government officials that he was leaving Cuba and flew to the Dominican Republic with between $300 and $700 million according to various estimates. Portugal’s António Salazar, a dictator allowed Batista to enter his country. By 1972, Batista settled in Marbella, Spain where he eventually died of a heart attack. On January 1st 1959, Cuban forces led by Fidel Castro entered Havana with no resistance from Batista’s defeated forces. Fidel Castro entered Havana several days later on January 8th with a victory march over a U.S. backed dictatorship that had mob ties. It was a new chapter in history for Cuba, but for Washington, it was the start of a political and economic war against the Castro government.